How to apply Databar formatting on Gridview Like Excel conditional formatting options using asp.net c#. 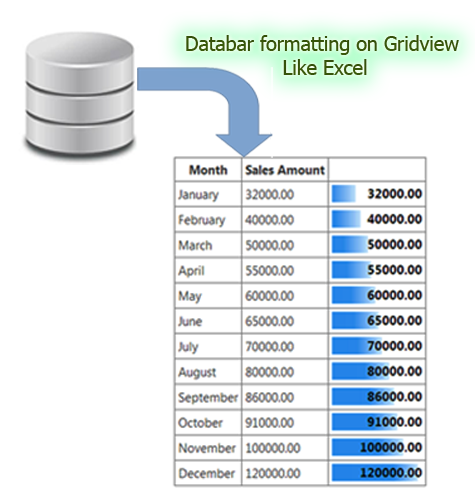 In this post I am explain explain how to apply Databar formatting on Gridview Like Excel conditional formatting options using asp.net c#. In MS Excel Data bars is a conditional formats that create visual effects in our data. These conditional formats make it easier to compare the values of a range of cells at the same time, just as we do in a bar chart. Here in this example, I have created a sales report shown data in a Gridview, where we can quickly see which months have the smallest sales, and which months have the largest using Databars like MS Excel. Step-3: Create table for store/fetch data. Step-5: Modify model for Store Percentage of data. Step-6: Add a Webpage and Design for show data with Databars. Step-7: Write code into page load event for show data.